NTCA predicts that total membership in 2016 will exceed record numbers. As of the end of May, the association has already matched its previous record of 1,150 active members – and end of August numbers place total members at 1,234. That’s compared to 1,077 by the end of August 2015. By the end of 2016, NTCA executive director Bart Bettiga expects membership to reach 1,300 active members. “We continue to have an active board of directors and a growing group of state ambassadors who have helped to raise awareness of the association in their respective markets,” said Bettiga. “This has helped us to grow membership on a local level.” Bettiga also cites the success of the association’s partnerships with flooring groups like Starnet and CCA Global Partners, which has allowed the association to provide education and training at their national events. Another powerful driver of membership growth has been the Partnering for Success program, developed with NTCA’s affiliate members. The program provides for product vouchers from manufacturers, importers, and distributors, to help members offset the cost of membership. Word of mouth has also played an important role, with communication on popular online networks such as the John Bridge Forum and Tile Geeks spreading the word of the benefits of NTCA membership. Joining the NTCA is easy – there’s a simple form on the association website at www.tile-assn.com. 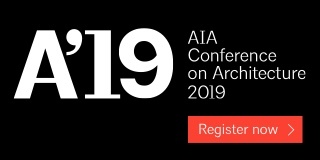 Members have immediate access to all the knowledge, education, and industry connections of the largest tile contractors association in the world. Got questions? Contact Jim Olson at [email protected] or phone 601-942-2996. Are you considering the apprenticeship program? As we continue to develop courses for the finisher apprenticeship program, I wanted to address some questions that contractors have had. If you are considering a program of your own, hopefully the following information will be useful for you. Q: Do I have to have a Department of Labor (DOL) approved apprenticeship program? A: No, this is your program to use as you wish. You can register it with the DOL if you wish or you can use the online courses to supplement training for your new hires and their on-the-job learning. Q: If I have a DOL approved program, does the online learning take the place of the classroom learning? A: With a DOL-approved apprenticeship program, you are required to have 144 hours of classroom training and 2,000 hours of on-the-job practical work each year. The first six months of online learning will make up approximately 10 hours of the classroom training, so you will still need to have classes with your apprentices. Some members are requiring their apprentices to take courses before the classroom training, while others are using it as a follow-up to make sure they retained what was learned in the classroom. Either way is acceptable since it is YOUR program. While we would be willing to offer suggestions, the NTCA has only developed the supplemental learning materials for you to implement as you see best for your company. Q: Do I need to sign up each of my apprentices or can I just buy one program for everyone to view? A: This again is your decision. If you have a DOL program then you may want to consider each individual being registered since there are tests at the end of each module. You can then use this information to track how well each individual is doing, and you can document that they have completed the course and the time it took them to complete each module. Or you can gather everyone in a group setting and view the course, then take the quiz together. Some contractors are even using these courses as part of the evaluation of each apprentice when they do performance reviews. Q: Do I need computers in the office for the apprentices to take the courses? A: No. As long as they can log into their NTCA account, they will be able to access NTCA University from any computer, tablet, or phone so they don’t need to be in the office to learn. As long as they have internet access, they can take modules. Visit the NTCA store at www.tile-assn.com to see the current listing of courses. If there is a course that you would like to see or if you are unsure of the types of courses available, please send me an e-mail at [email protected] or call me at 770-366-2566. 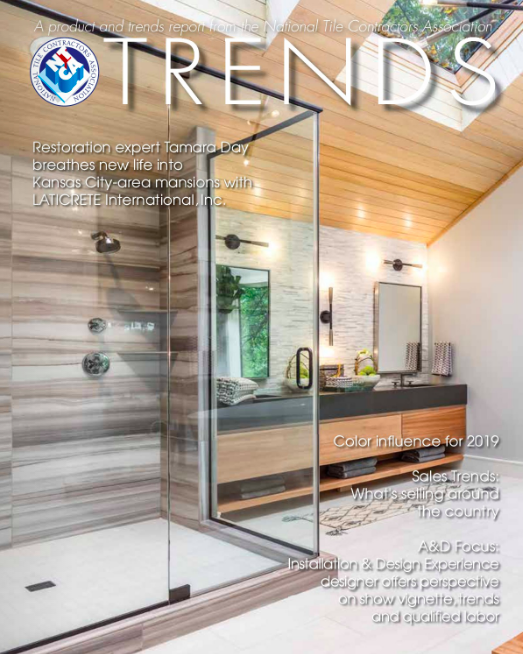 Since Coverings 2008, tile installers across the country have been gathering at industry trade shows, product manufacturers, distributors, and installation contractors. Why? 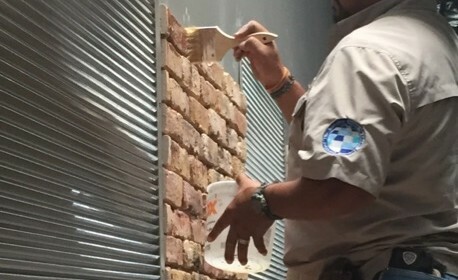 To take part in a hands-on test that demonstrates they have the skills to deliver an installation that meets industry performance and workmanship standards. 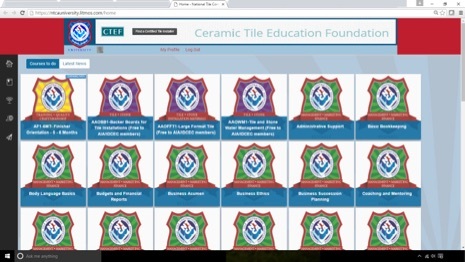 This hands-on test is the second portion of the Certified Tile Installer (CTI) test conducted by the Ceramic Tile Education Foundation (CTEF). It follows a 155-question multiple choice technical proficiency exam typically taken online. Over the last eight years since the inception of the Certified Tile Installer test, the program has expanded, with more installers seeking certification. In fact, to date 1,252 installers from 46 states have been certified through the CTI process. As a result, the CTEF is taking steps to expand the number of test evaluators available to proctor the hands-on test. These test evaluators will be in place the last quarter of 2016. The video is about 19 minutes long. The video is still in beta testing and may undergo changes before being released on the CTEF YouTube channel by the end of the year. Levantina (levantina.com), the multinational Spanish-based provider of natural stone, is supplier to the world in terms of natural stone. A recent installation of natural stone at the acclaimed annual Starlite music festival and a stunning installation of Crema Marfil Coto® in a Texas residence demonstrated the breadth of natural stone products from this company. Once again, natural stone products from the company were chosen by architect Héctor Ruiz-Velázquez to embellish the Starlite Marbella (starlitemarbella.com/en/) arts festival that took place in the Nagüeles quarry in Marbella in July and August 2016. He created an astonishing mix of luxury and glamor for the VIP reception area, which houses and becomes a social entrance hall for a very exclusive audience, with granite from the Natural Stone collections from Levantina starring at the welcome desk. The whole space seems extracted from the quarry, with chiseled walls and floors integrated with the natural setting with the natural setting and all architectural elements such as desk, bar and fireplace, seeming to rise out of the raw stone itself. The sensation extends from floor to ceiling, and offers a unique feeling of authenticity, exclusiveness and luxury. Starlite transcends a simple open-air setting for concerts. It is a meeting place, a social and cultural reference for architecture, haute cuisine, movie premieres, fashion shows, art exhibitions and exclusive parties including a Starlite Gala benefit, hosted by Antonio Banderas. In July 2015, 2,500 sq. ft. of Levantina’s Crema Marfil Coto was installed in a grand Westlake, Texas, residence. The homeowner wanted a grand and elegant setting for this new home, which include 18” x 18” and 24” x 24” Crema Marfil Coto tile and special cuts for the spectacular staircase crafted from slab. With six factories in Spain and one in Brazil, Levantina’s facilities are equipped with the latest generation of technology and its production processes are subject to exhaustive checks to guarantee the highest quality of its finished materials, maintaining ISO 9001 in its facilities that the company’s commitment to the continuous improvement of its manufacturing resources. Levantina presently extracts more than 2.2 million m3 a year from its quarries, including the Monte Coto quarry in Alicante, Spain, from which this internationally famous Crema Marfil is extracted. Logistics for this project were handled out of the company’s Dallas, open-to-the-public showroom. The company has U.S. locations in Dallas, Atlanta, Chicago, Austin and a new facility opening in Charlotte, N.C., this year. Levantina is a world leader in production, transformation and marketing of natural stone. The multinational, born in 1959, has the world’s largest deposit of Crema Marfil marble, located in Alicante. Levantina has many quarries, seven factories and 25 distribution warehouses, with exports to more than 114 countries in the European Union, America, the Middle East and Asia. Levantina’s portfolio includes more than 200 different materials, among which Naturamia® Collection and Techlam® stand out. The tile or stone is installed, the area cleaned up, and you step back and admire your work, then go on to your next job, right? Contractors say cleaners, sealers and maintenance packages can add protection to the project and its long-term beauty and performance, and keep contractors connected to their customers so they are top of mind for that next tile or stone job or referral to a friend or business. Sealer applied and allowed to flash on the surface, possibly on stone that was too hot or sealer applied in direct sunlight. Brookes also said that the combination of green cleaning products, shower gels, shampoo, body oils and the humid environment of a shower is contributing to frequent growth of the bacterium Serratia Marcescens. This gram-bacterium, which creates a pinkish-reddish-orange slimy bloom on surfaces, is a culprit in urinary tract and respiratory infections, especially in hospital settings and where instrumentation is involved for the patient. “We educate the end user on the limitations of a sealer and inform them it’s not a one-time application; regular maintenance and reapplication will safeguard their investment,” he said. An attempt to remove a stain with a poultice only made the situation worse. For NTCA State Ambassador Dirk Sullivan of Portland, Oregon’s Hawthorne Tile, requests for repairs and recaulking or regrouting have been frequent since he started his business in 2000. This kind of work “helped pay the bills” during the 2008-10 economic downturn, he said. But once the business of larger, custom jobs picked up again, there wasn’t much time to pursue this type of work. Hawthorne Tile has evolved its selection of products, choosing Dry Treat, a relatively exclusive product in the region. It added in LATICRETE and AquaMix products to fill some holes in local representation. After meeting Fila’s Jeff Moen at Coverings early this year, Sullivan was super impressed with the line of cleaners and the “top-notch customer service” offered by this company, which includes educating Hawthorne staff – and by the fact that Hawthorne would be the exclusive distributor of the line. “As we complete our projects, we give our customers a gift bag with sample cleaning products and instructions as well as a refrigerator magnet with our restoration team contact number and info for re-ordering cleaning products as they need it,” Sullivan said. J&R Tile crews applying sealer on different types of surfaces. How do you combat lack of care in commercial kitchens, lack of sanitary cove base in restroom facilities and the darkening and residue buildup consequences of using dirty mop heads with regular detergent soap? If you are Five Star Contractor J&R Tile, Inc. of San Antonio, Texas, you offer custom maintenance packages free for the property owner of a new construction or remodel to pass on to the custodial staff, along with complimentary product samples with demonstrations to help staff members use proper procedures to maintain their warranty and keep the project looking great. Fila products are the company’s go-to, due to its outstanding customer support, and a useful iPhone app for staff and customers that displays a flowchart of the proper product for each application. Lori Coates, StoneTech rep out of Houston, also provides unbeatable customer service. In addition to the free maintenance service, J&R dialogs in pre-construction about cove base and other options like metal trims. “We believe when cove bases are deleted because trim pieces can be pricey with budgetary constraints, it is our due diligence to offer solutions for the life of the installation with the end user in mind,” she said. Providing a custom maintenance package, with proper instructions from the get-go, eliminates these problems, and contributes to satisfied customers and repeat business. Nichols Tile & Terrazzo Co., Inc.
Nichols Tile & Terrazzo Co., Inc., got its beginnings back in 1946 when David Nichols started his career as a helper for Art Mosaic in Nashville, Tenn. After a leave of absence to join the Army, he returned from the Korean War in 1953 with a Purple Heart, and rejoined the private sector working on and managing out-of-town large commercial terrazzo projects. In the early 60s he left, and enjoyed two different partnerships with Glenn Arrington and Bob Dudley before starting Nichols Tile & Terrazzo Co., Inc. in 1973, with his wife Juanita anchoring the office. At Coverings 2016, NTCA’s Jim Olson (r.) presented Brad Denny with a Special Recognition Award for his efforts in promoting NTCA through social media and helping the association increase its membership. In 1974, Nichols’ stepson, Billy Denny, joined the company straight out of college to help with the estimating until he could find another job. “He jokes that he has yet to find anything,” said Bradford (Brad) Denny, Billy’s son, who came on full time as an installer in 1998, after working four years as a helper when not in school. Billy’s daughter, Amber Hunter, started working in the office in 2001 and has gradually taken over the responsibilities of her grandmother. Today, Nichols Tile & Terrazzo Co., Inc., in Joelton, Tenn., is a NTCA member, focusing on commercial specialty projects and large custom residential, and has branched out into thin porcelain tile, while enjoying the challenge of large mortar beds, pools, fountains and waterproofing. Brad Denny, now project manager, serves the association as the NTCA Region 6 Director. He also moderates the online NTCA Members and NTCA Regional and State Ambassadors Facebook groups, and introduced NTCA to the Tile Geeks Facebook page, through which NTCA has gained new members. He was honored at Coverings 2016 as one of the Coverings Rock Stars, a group of some of the best and brightest young talent in the industry, and received a NTCA Special Recognition Award at Coverings for his constant voice in promoting NTCA in all forms of social media. This project was a vignette for a manufacturer displaying at a hotel industry conference. It received a People’s Choice Award for best display. Nichols Tile & Terrazzo was a member of NTCA’s precursor, STTMAC back in the day, but Denny said, the company “did not take advantage of the benefits of actively participating in the organization.” The company re-upped in 2010, through the influence of Tom “Hammy” Hambrock, who was then serving as NTCA Middle Tennessee State director. This 3,000 sq. ft. commercial kitchen was challenging due to the height restriction and over 35 drains. Pictured is Mario Bertoli, whose family has a rich history in the Nashville tile industry. In 2005, many things started shifting for Denny. He married his wife Nicole, and became more interested in the overall workings of the family business as he considered the future of his own family. Through his new laptop, he discovered johnbridge.com and a community that was passionate about tile. Many professionals he encountered were connected or spoke about NTCA and it “sparked a desire to become a part of that. Under this stunning mosaic is a heated floor. The sheet-mounted material did not enjoy staying together and many of the small mosaics were installed piece by piece. Denny has the highest praise for the opportunities afforded by NTCA, crediting it for helping him grow as both “an installer and businessman. Through relationships with others that are at a place we’d like to be as a company, all the while helping those who’d like to be where we currently are, the NTCA provides a network of contractors that are interested in continuing what is essentially an ancient art form, that can be profitable for many families,” he said. Pictured is Chris Martin, a longtime Nichols Tile & Terrazzo employee, cleaning up the pool decking and coping the company installed to complement the new surrounding wall tile. This remodel was a major updating to the historical first indoor pool in Tennessee. It involved a very detailed slope design to the mortar bed in a cramped space, new floated columns, and waterproofing to protect the space below it. Thin tile is something Nichols Tile & Terrazzo has become comfortable with, to the point of tackling difficult projects. Pictured here is a green marble overlay with epoxy mortar. Denny is also keen on being credentialed, having obtained his Certified Tile Installer status (CTI #1190) at TISE 2016, and is looking to gain ACT certification in 2017. Others at Nichols are also seeking CTI status in the coming year as well. This is another example of a difficult thin tile project. These concrete columns, in the middle of a preferred member lounge in a NHL arena, were clad with narrow strips of 3+ thin tile panels. Through training with one of the major manufacturers, Nichols Tile & Terrazzo was able to come in and finish this project started by another contractor. The Crossroads Business Park is a modern, 1.5 million-sq.-ft. (139,354 m2) office and retail space in sunny Southern California. The Crossroads Business Park is a modern, 1.5 million-sq.-ft. (139,354 m2) office and retail space in sunny Southern California. It features a host of modern amenities and a progressive design that includes large-format travertine natural stone tile on the façade of the building. The developers were committed to a sustainable building process and employed a number of innovative approaches in the construction that posed several challenges. The building is four stories tall and was built using concrete, tilt-up walls, meaning that the walls were poured horizontally and then hoisted into place and tied together. LATICRETE was brought in early in the process to identify the best materials and implementation to achieve the desired results for the exterior tiling. A host of modern amenities and a progressive design was planned for the project, including large-format travertine natural stone tile on the façade of the building. DIFFICULT ENVIRONMENT – Surface temperatures on buildings in Southern California vary widely throughout the day, often swinging from as low as 60°F (15.5°C) overnight to 120°F (48.8°C) degrees in the heat of the day. Because of these dramatic shifts, expansion joints need to be larger than normal to avoid thermal shock and ensure consistent performance. In addition, the building is often exposed to wind-driven rain and must remain completely protected from that moisture. SIZE OF THE TILE AND HEIGHT OF INSTALLATION – The 12” x 36” (30.5 x 91.4 cm) large-format travertine natural stone tiles used on the building façade are quite heavy, posing additional liability issues on a four-story building with walkways below. Permanent, dependable adhesion is absolutely required to avoid any potential issues with tiles falling from the building. LATICRETE 254 Platinum thin-set mortar was chosen for certain adhesion of the large-format tiles, installed as high as four stories up. 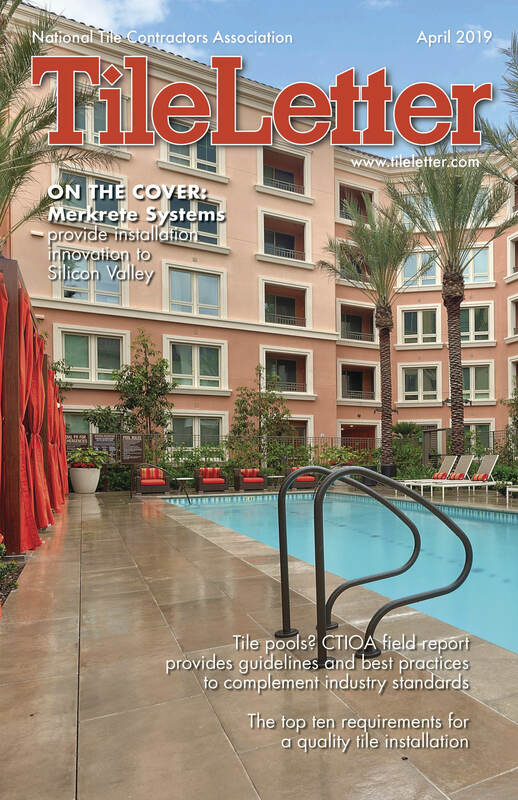 Van Nuys, Calif.-based Certified Tile, Inc. chose LATICRETE for its proven solutions in these kinds of applications. To address the location’s difficult elements, Certified Tile, Inc. used the right waterproofing and anti-fracture membrane and grout to ensure the installation would stand for years to come. To waterproof the entire installation from rain, moisture and the elements and to provide anti-fracture protection from the substrate, Certified Tile, Inc. used LATICRETE HYDRO BAN®. HYDRO BAN is a thin, load-bearing waterproofing and anti-fracture membrane. This single-component, self-curing liquid rubber polymer forms a flexible, seamless waterproofing membrane and bonds directly to a wide variety of substrates. To accommodate the larger-than-normal expansion joints necessary to avoid thermal shock created by extreme temperature variations, Certified Tile, Inc. used LATASIL™ silicone sealant to treat the movement joints. The sealant was color-matched to PERMACOLOR® Grout, offering a seamless transition to the movement joints that allows for expansion and contraction. The building is four stories tall and was built using concrete, tilt-up walls, meaning that the walls were poured horizontally and then hoisted into place and tied together. PERMACOLOR Grout is a high-performance, fast-setting grout that provides a grout joint that is dense and hard. It also provides outstanding color consistency and improved stain resistance. LATASIL™ is a high-performance, one component, neutral-cure, 100% silicone sealant designed for ceramic tile and stone applications. Addressing the size and height of the project required use of another LATICRETE product. To ensure the project’s large-format tiles stayed in place, Certified Tile, Inc. used 254 Platinum to adhere the tiles to the structure. 254 Platinum, the ultimate one-step, polymer fortified, thin-set mortar for interior and exterior installation of ceramic tile, stone, quarry tile, pavers, and brick was used to adhere the tiles to the building. 254 Platinum, designed to just mix with water, has a long open time with unsurpassed adhesion and workability and contains antimicrobial protection to inhibit the growth of stain-causing mold and mildew in the substrate. The heavy 12” x 36” large-format travertine natural stone tiles used on the building façade required permanent, dependable adhesion to avoid potential issues with tiles falling from the building. The installation took a little more than three months to complete and the materials come with a 25-year warranty. With the right products, Commerce Construction was able to achieve the elegant look the client wanted while attaining an installation that will hold up well to the constant heat and occasional rain of the area. The building is a success and is a centerpiece of the business park, helping to draw a variety of tenants who appreciate the outstanding construction quality. The installation took a little more than three months to complete and the setting materials come with a 25-year warranty. If your company’s sales results were a dance floor, how would it look? Are the numbers jumping off the page, dazzling you with their lively performances? Or are they slow, sluggish – perhaps even disappearing entirely? To keep the party moving, every business needs to regularly remix its line of products or services. There are many potential causes of a sales slowdown. But these troubles aren’t all bad — they can help you shape your revised offerings. Start with the obvious: Are your customers drifting away? Conduct market research to find out whether they still like what you’re selling or if their needs have changed. Evolution is normal, so be ready to adjust your menu to keep pace. CTDA membership increases your opportunities to network – and travel. This group of CTDA members enjoyed a trade mission to Turkey in 2014. There are a few telling market research questions that are key to successful market research. Ask the consumer for his or her biggest challenges/ frustrations regarding your product, i.e. 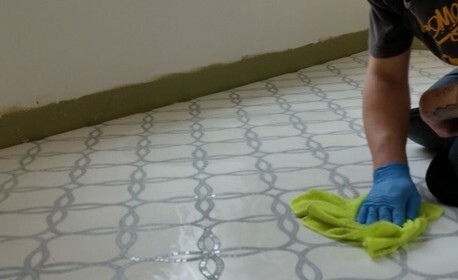 ceramic tile, and what those challenges are costing them. Next ask what goals in the near future they have regarding your product. Present your product (which would solve their challenges) and ask if they would be interested in the product and how much would it be worth to them. Finally confirm the best method of marketing by asking for the consumer’s preferred method to receive information regarding your product. Finally, don’t ignore the economy – both national and local. Market conditions can influence the sales of even the strongest products or services. Try to bolster the strongest ones, but also consider discontinuing weak ones or adding new ones that reflect the strength of the local economy. In an economic downturn, you may also find that reinventing your weak products will increase their sales; package them differently or price them competitively and you may see an increase in sales. An effective remix of your products or services can turn a sad song into a happy tune. As president of the NTCA it is very gratifying to see our membership grow to almost 1,300 members – in fact it is amazing! The NTCA is the best investment I have made in my business, and I hope most of you feel that way as well. One question I would like to pose to our contractor members is: “What would it take to get more of you to attend our annual meeting at Total Solutions Plus (TSP)?” We do not get a lot of attendance from our members. We have constantly sent out surveys and asked questions at other tradeshows trying to get more participation for this conference. In the past we have waived the registration fee, given product away and advertised in different media, trying to reach our contractor members. These have not worked very well. Our goal is to have 15-20% of our contractor members attend TSP. This would mean 150-200 contractors. Some of the most common answers I get from contractors who do not attend are cost and timing. In terms of cost, a lot of members think that the registration, hotel and traveling expenses are too costly. And members have also told me the time of year is bad; that earlier or later is better for them. Some contractors have told me that Coverings is a better fit. These reasons and more are all understandable, but I would like to address some of them and give reasons why you should at least try to attend TSP one time. The educational and leadership opportunities are second to none as pertains to tile contractors. The educational tracks are designed around the tile contracting trade, and address everything from dealing with distributors to documenting issues on job sites. Networking with the leaders from the distributors and manufacturers of products tile contractors use every day. You get to meet the CEOs and presidents of these companies in a setting that is a lot more intimate than huge trade shows. Receptions and parties are designed that enable you to talk one-on-one with these leaders. You can make contact with them and get a heads-up on new products, and try them before they are introduced to the public. You can even share your thoughts on their products. The time of year question is interesting. TSP is planned out 12-18 months in advance and we try to distribute the conference in an East, Central, West fashion to hit all parts of the country. The dates are such that they are not too close to Thanksgiving, but also we have to give the manufacturers time to get back from Cersaie (Italy’s tile show) at the end of September. In terms of cost, we have tried to lessen the cost by using overflow lodging at less-expensive venues similar to the Coverings model. Registration costs are put in place for a couple of reasons, to offset the speaker and food costs. Plus we believe that people need to have a little investment in their education. Attending this show is not a last-minute decision; it has to be circled as a date on your calendar. The most important reason I attend TSP is to network and learn from other tile contractors. There have been at least two occasions where conversations with other tile contractors dealing with my business have literally saved five figures in business losses – this is not an exaggeration at all. Being at TSP saved me big money. Lastly, as I look back on over 16 events I have attended – nine Total Solutions and seven Total Solutions Pluses – I realize that I would have never had the chance to meet so many like-minded people, mentors and benefitted so much from their knowledge. I never would have had the opportunity to grow as a person or a leader without this conference. Frankly, I don’t think I would have ever had the chance to be president of our great association if I had not attended TSP. It is worth your investment in both time and money, so do yourself a favor, make plans to attend TSP 2017 in Washington, D.C., November 4-7 at the Marriott Washington Wardman Park hotel. In this issue, we are beginning a new feature: NTCA Previews. You’ll find it under the NTCA News section. NTCA Previews is excerpted news from a monthly report on association activity that executive director Bart Bettiga just started issuing to directors and staff. It gives you an idea of all the things NTCA is actively working on. This was an eye-opener for me as to the vast extent of everything NTCA is involved in, and I hope it will be for you too. NTCA has its fingers in many pies, with committees for training and education, technical, convention planning, social media, business development, NTCA Reference Manual, finance, membership, methods and standards, and a new one being developed for social media. We have regional and state ambassadors who are supporting education and proper training – as well as NTCA membership – in all 50 states. We have a Youth Leader Scholarship and trainers who are on the road bringing education to local markets, as well as a vibrant seminar program that addresses industry issues with the convenience of a computer and our developing NTCA University program as well – plus we are becoming more of an educational presence at shows that cater to different segments of the industry, such as our participation at the recent Remodeling Show | DeckExpo | JLC LIVE (R|D|J) in Baltimore. It’s hard to know EVERYTHING that is going on with NTCA staff, volunteers and officers. But NTCA Previews is meant to do just that – give you a sense of what your association is doing on a monthly basis to help you be your best in this industry, and help the industry be its best in developing training, standards and addressing issues that cause problems with installations. Check the NTCA Previews each month for ongoing news of new initiatives and updates on existing ones. The other feature in this issue I’d like to draw your attention to is our annual Women in Tile feature. We look at female leaders in three companies – J&R Tile, Visalia Ceramic Tile, and Soci Tile & Sink – and the positive, professional contributions they are making to our industry. Women bring a unique skill set to their roles in our industry. 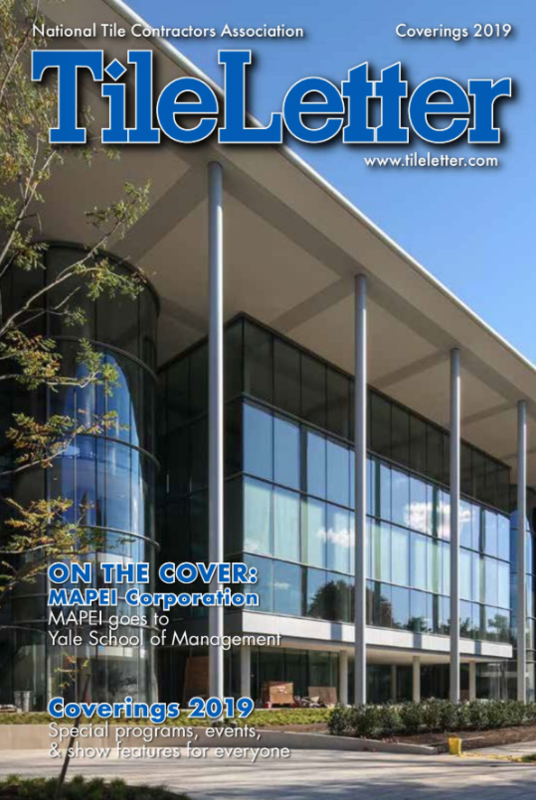 Combined with their expertise and success within their companies and in the betterment of the industry as a whole, the women profiled in this TileLetter issue, and in the industry at large, command respect and admiration among their peers for work well done.